When the aircraft appeared on the fighting front in April of 1918, Allied pilots at first underestimated the new fighter because of its squarish, ungainly appearance, but quickly revised their view. The D.VII’s had the unique ability to seemingly “hang on its propeller,” and fire into the unprotected underside of enemy aircraft which made it a feared combat opponent. 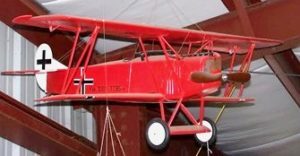 The final Armistice agreement specifically demanded that all Fokker D.VII’s be immediately surrendered which attested to the generally high regard for the airplane. In response to the loss of air superiority in late 1917, the Germans organized a competition for new fighter designs held in January 1918. 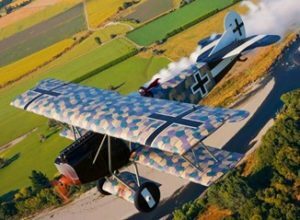 The winner was the Fokker D.VII with Fokker receiving an order to build 400 aircraft. The airplane was a single-engine, single-seat, biplane initially with a 170-180 HP Mercedes D.IIIa water-cooled engine. Later aircraft were fitted with 18-200 HP engines. Germany produced about 3,300 D.VII aircraft in the second half of 1918. This was accomplished through the use of multiple manufacturing plants. The airplane was noted for its high maneuverability, ability to climb at high angles of attack, remarkable docile stall, and its reluctance to spin. The favorable characteristics resulted in the aircraft being credited in turning a mediocre pilot into a good one, and a good pilot into an ace! Wingspan 29 feet 4 inches Length 23 feet Empty Weight 1540 lb. Gross Weight 1936 lbs.